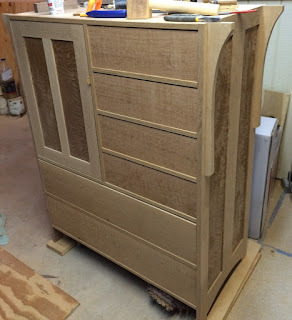 My goal for this last weekend was to get enough progress that I'd be able to get the dresser carcass into my finishing room. Since my finishing room is separated by two flights of stairs from my workshop I didn't want to have to schlep drawer fronts up and down stairs when tweaking them to fit nicely with even spacing. Long story short, I didn't accomplish my goal. I spent a few hours selecting the boards for the drawer front and cleaning them up and I got the front and back skirt shaped and finish sanded. It was right about this point that I remembered my copious glue use on the saw ponies and that I had finished off my last bottle of Titebond III. I got close but I wasn't able to attach the skirt boards. I had a free evening tonight so after an hour of Mass Effect 3 and then watching the Daily Show with my wife I got down into the workshop for a few hours of work. I cleaned up the mess left from jointing the drawer fronts, glued the two skirt boards onto the case and started another small project. The blue tape you see is holding on the off cut from cutting the arc on the rail. Using the off gives me a flat surface to use the clamps. The back rail doesn't get a curve and is clamped the same way. The next question you ask is, "Why did it take you all weekend to cut out the drawer fronts and why are you starting another project?" Well, that's actually two questions and my normal policy is one question per post but I'll make an exception this time. First, why did it take most of a weekend to cut the drawer fronts. 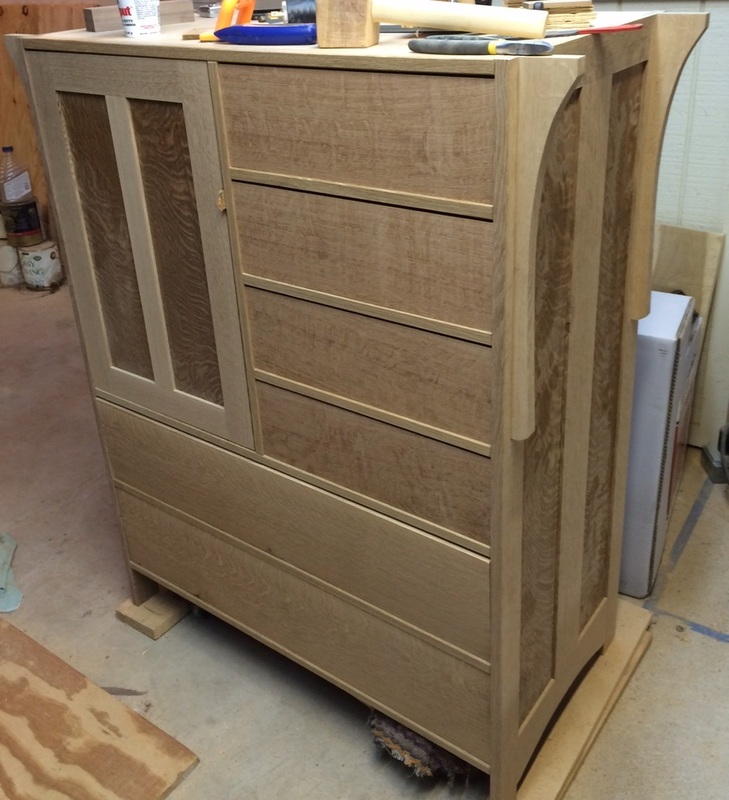 Well, to make a short story long, the bottom two drawers in the dresser are 8" wide by 36" long. I wanted to make them out of a single board with good figure across the entire drawer front I needed to find a pretty special board. I actually ended up finding two boards that each had a long enough section that had nice figure for most of the width. So, looking over my available boards and deciding which section I was going to take took more than a trivial amount of time. Next the boards were 5/4" thick which is both good and bad. It's good because it gives me lots of thickness to work with to get the board flat and straight. It's bad because that means I need to remove 1/2" of material to get it down to the 3/4" thick the plans call for. Most of that gets done at the planer and since I only remove about 1/32" at a time, that ends up being a lot of passes through the planer. But that's not all! My jointer is only 6" wide. There are a coupe of techniques to flatten one face of a board that is too wide for your jointer. One is to use your planer. Unfortunately if the board is warped when you put it through the planer it will come out the other side smooth and warped. To make it work you build a sled - either temporary or a slick adjustable one [For example, this one]. I tend to go ahead and use my jointer. This technique is to take a deep swath ~1/8" in a single pass. This leaves a lip on one side of the board. If the lip isn't too wide I'll use a hand plane to take it off. In this case the lip was 2" wide by 36" long in white oak, much more than I wanted to hand plane. What I do in these cases is put a support board on the flat part and then put them through my planer. Once the opposite side is flat I flip the board over and plane the lip off. Then it is a matter of planing the boards to 3/4". I stopped when there was about 1/32" left on the long wide boards, cut, jointed and planed the small drawer fronts to about the same thickness then passed all the drawer fronts through the planer. This gets them all to be exactly the same thickness. It's probably irrelevant for drawer fronts but it is good to follow this process when shaping similar boards. Use the planer to remove ~1/2" material 1/32" at a time. So, the new project I started. A friend of mine just got a 3d printer and he just started printing with ABS. Apparently ABS needs to be kept warm throughout the printing process. His printer has a heated bed so all he needs is an enclosure around the printer and the bed will keep the air warm enough to print ABS. I had some space 1x3 pine and some 1/4" MDF so I am making him an enclosure. It'll take me a few hours to do; however, in the big scheme of things it won't be too bad. Oh, and I almost forgot... I made little steps for my cat over the weekend. The poor thing is about twenty years old and is getting little arthritic and cannot jump up to the couch anymore. Her solution is to sit next to the couch and meow until someone comes and lifts her up. I'd made a jumping box for a friend's dog a few years ago, I got it back when my dog needed a little help jumping into the back of the Forrester. 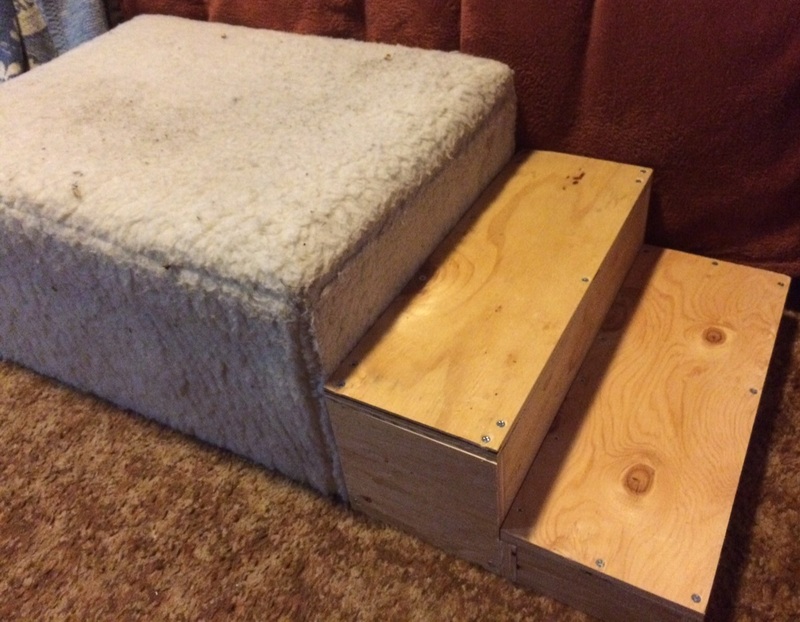 We put that next to the couch but it was still too high for her so I made some shorter steps out of the scrap plywood from the saw ponies I made two weeks ago. If I get all that done I'll have the bulk of the construction tasks left and just have finishing left.